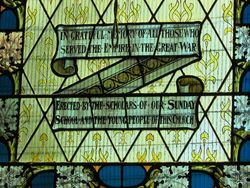 Three stained glass windows commemorate those who served in World War One. Below the window is an honour roll. 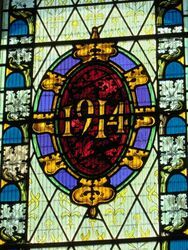 The windows and honour roll were dedicated at the opening of the church in 1930. A new Methodist Sunday school has been erected at Benalla at a cost exceeding £2000, a gift of Mr. John Cooper, of Benalla. It has been named after its donor. A new Methodist church has also been completed, the design being a combination of Gothic and Norman. The structure has been erected on the old church site at the corner of Carrier and Church streets. It is built of soft-toned brick and an imposing appearance is lent by its elegant tower. The interior of the church is a revelation of beauty. The seating, which is of Australian fiddleback oak, will accommodate a congregation ot 350, and the pulpit, the front of which has been beautifully carved is constructed of the same timber. 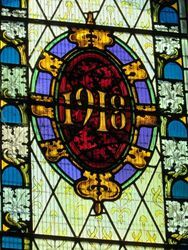 The pulpit is dedicated to the noble services of the womanhood of the church, and a sacred sentiment is also attached to the three beautiful stained glass windows. 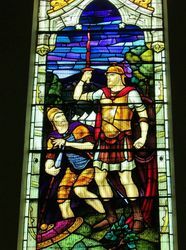 The central window is a reproduction of Holman Hunt's immortal picture, The Light of the World. 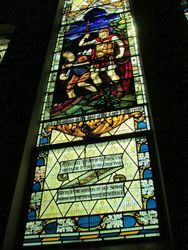 The soldiers' memorial window, on which is inscribed, "To to the memory of those who served the Empire in the Great War," was erected by the scholars of the Sunday school, and the young people of the church. 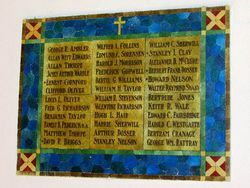 Immediately beneath the window is an honor roll, set in attractive mosaic, bearing the names of those members of the church who look part in the great war. The ornate pipe organ, set directly at the rear of the choir stalls, is a welcome addition to the church. The opening ceremony was conducted by Rev. W. C. Bridgeborn. The Age (Melbourne), 6 October 1930. The North Eastern Ensign (Benalla, Vic. ), 26 September 1930.